There is a boom in the number of rickshaws and/or cycle taxis here in Copenhagen. They are becoming a common sight and they are everywhere. Tourists and locals alike use them - albeit mostly the former here in the busy summer season. They're big. They're wide. They take up space on the bike lanes. More often than not they are ridden by young foreigners who have settled in Copenhagen. There has been some problems with the cycle taxis in that many interpret the rules of the roads rather freely. The City of Copenhagen's Bike Office - Cykelsekretariatet - were aware that something needed to be done about the issue before it snowballed. The solution? 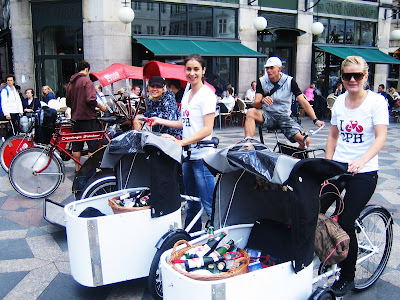 The City sent two girls out into the bike culture on shiny, white Nihola cargo bikes and wearing I BIKE CPH t-shirts. Over two days they rode around and visited the cycle taxi riders. In the cargo bike were cold, organic soft drinks and juice from Søbogaard as well as bicycle maps of the city. They handed out the drinks and the maps to the cycle taxi riders, to make them aware that there were issues to be resolved. What a way to do it. Instead of clamping down with legal solutions, just send two lovely Copenhageners out to encourage them to adjust their cycling behaviour. Give them a cold drink as a sign of respect for their hard work and their important place in our bike culture. Give them a map to help them figure out which routes are best. This is how you make a campaign aimed at changing behaviour. Positive, encouraging and cosy. No fear-mongering, no finger-pointing, no legal threats or police prescence. Lasse Lindholm, Head of Projects at the City's Bike Department said, "The cycle taxi riders felt like they were being treated like kings and with respect." Nice one. There are so many good ideas coming out of the Bike Department these days. The current fearmongerers at Dansk Cyclistforbund [Danish cyclists' union] - historically a dynamic, positive organisation for cyclists - can certainly be inspired by such initiatives, instead of playing their fear game and reducing the number of cyclists through negative campaigns. They should also look south to the Netherlands and Germany for inspiration about how to encourage cycling and public health, as highlighted in the previous post about Promoting Cycling.